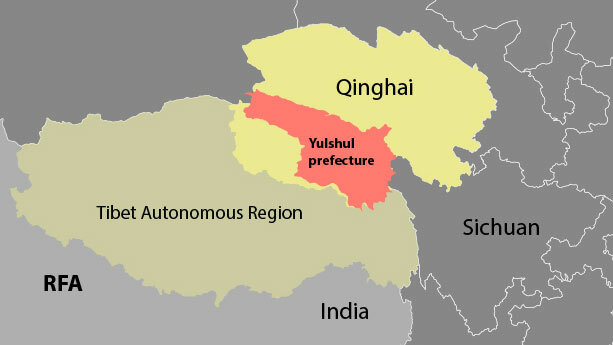 (TibetanReview.net, Jul14, 2018) – Chinese police were reported to have used severe violence, including with firing of teargas shells, to break up a Tibetan demonstration Jul 7 against suspected plans involving corrupt local officials and businessmen to dig for mineral ores in their area of Yulshul (Chinese: Yushu) Prefecture in Qinghai Province. Around 100 local Tibetans gathered to protest that day at a place called Upper Dechung, where Chinese mining operations were already underway, reported the Tibetan service of rfa.org Jul 11, citing a local resident. Chinese police called in to deal with the situation attacked the protesting crowd, including with the use of teargas. The employment of severe violence by the Chinese police was reported to have left many Tibetans unconscious or otherwise injured. “A 70-year-old man called Sogrui Pewang, … had to be rushed to … hospital to be treated for his injuries,” the source was quoted as saying. Due to the imminence of further violence from the local police and hoping to get justice from higher level authorities, 50 to 60 local residents were reported to have left that evening to ask provincial authorities for help and protection. However, they have not been heard from ever since, the report cited the source as saying. The protest was stated to be a culmination of two months of fruitless efforts at ending the suspected mining plans on local mountains. The source has said corrupt local officials in collaboration with “other persons in the county” were being suspected by the local people of involvement in the planned digging for mineral ores from their area on the pretext of building a road. Chinese mines have led to endless protests in Tibetan areas as they result in air, water and land pollutions; confiscation of Tibetan land; desecration of sacred sites; and massive influx of socio-economically and ethnographically disruptive Chinese immigrations. But the protests have only led to violent repressions, arrests, and jail sentences even in cases of patently illegal and highly destructive mining projects.